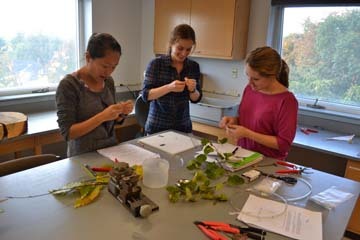 Students in Brett Huggett’s Plant Physiology class (Bio 380) learn hands-on about how plants function. Courses offered for the current and upcoming terms can be accessed through the Garnet Gateway. To help students plan for the future, projected course offerings for the current year and two years beyond are provided by the department. These projections are subject to change and are updated on a regular basis. Despite a robust increase in cancer research, the World Health Organization predicts that cancer cases are still expected to rise 70% over the next two decades. In this course, students examine the biological basis of cancer, including the role of oncogenes and tumor suppressors in regulating how the cell divides, how environmental agents and viruses can induce DNA mutations leading to cancerous growth, and the genetic basis of certain predispositions of inherited cancers. Students also learn about the history of cancer treatment, to understand where we are in the fight against this disease. Enrollment limited to 39. [S] Staff. An integrated, interdisciplinary marine science overview encompassing physical, biological, and social aspects of the marine environment. Oceanography topics encompass origins and geological history of the oceans, structure of basins and sediments, ocean chemistry, as well as currents, waves, and tides. Biological subjects include diversity, physiology, and behavior of marine organisms, ecology of major marine communities, and global change biology. Social considerations include human impacts on marine environments (including fisheries) and conservation. Enrollment limited to 39. [S] [Q] Staff. Physiology, the study of how organisms function, has benefited tremendously from studies of amazing animals doing amazing things. How do bar-headed geese fly over the top of Mount Everest when humans struggle to reach the summit? How do fish withstand body temperatures below the freezing point of water? This course explores how animals work under extreme environmental conditions and what this reveals about human physiology in health and disease. Enrollment limited to 39. [S] R. Bavis. BIO 117. Plants and Human Affairs. Economic botany is the study of how humans use plants for food, shelter, medicine, or textiles. Ethnobotany is the study of traditional knowledge and customs of particular human cultures concerning the use of plants for sustenance and for medicinal and religious purposes. This course provides a broad overview of both disciplines, with an introduction to plant anatomy and biology. Students explore the human uses of plants (and fungi) for perfumes, spices, medicines, hallucinogens, fermentation products, oils, rubber, textiles, wood, sugar, cereals, and legumes, in addition to exploring how various indigenous cultures have used plants. Not open to students who have received credit for BIO s11. Enrollment limited to 39. [S] B. Huggett. BIO 124. Plants and Human Affairs/Lab. Economic botany is the study of how humans use plants for food, shelter, medicine, or textiles. Ethnobotany is the study of traditional knowledge and customs of particular human cultures concerning the use of plants for sustenance and for medicinal and religious purposes. This course provides a broad overview of both disciplines, with an introduction to plant anatomy and biology. Students explore the human uses of plants (and fungi) for perfumes, spices, medicines, hallucinogens, fermentation products, oils, rubber, textiles, wood, sugar, cereals, and legumes, in addition to exploring how various indigenous cultures have used plants. Not open to students who have received credit for BIO 117. Not open to students who have received credit for BIO s11. Enrollment limited to 39. [S] [L] B. Huggett. The ability to effectively communicate science-related topics to nonexperts is essential for a successful career in science, and also critical for fostering public support of taxpayer-funded science research programs. Using recent examples from the biological sciences, students explore various ways and means to communicate science to public audiences through creative project-based learning exercises, including written science journalism articles, public speaking to local community groups, and multimedia video productions. Students examine how narratives and storytelling can be more effective for public engagement and comprehension of science than the information deficit model, and inevitably learn a fair amount of biology along the way. Not open to students who have received credit for FYS 465. Enrollment limited to 39. (Community-Engaged Learning.) [S] A. Mountcastle. BIO 128. Out of the Sea. This course examines human existence through the lens of the world’s oceans. Students consider animal evolution on deep time scales and how signs of our marine origins can be found throughout our bodies. Next, they focus on more recent time scales, and evaluate the role of oceans in human migrations. In the process of “finding our roots,” a goal of this course is to demonstrate human connections, and to deconstruct typological concepts of human race. Finally, oceans control global climate and students explore human-induced changes to global environments, and how oceans might offer solutions to sustainable existence. Enrollment limited to 39. [S] Staff. BIO 133. Biology of Cooperation. This course explores why organisms cooperate and how cooperation can be maintained in the face of cheating. Topics include the evolution of sociality and cooperation within species as well as mutually beneficial interactions among species. Students consider how the same broad ideas about conflict and cooperation can apply to organisms ranging from bacteria to humans and explain phenomena as disparate as pollination and cancer. Students evaluate evidence for various models of cooperation, learn how to use data to understand why organisms cooperate, and develop their own cooperation and communication skills through group activities and a community-engaged learning project. Not open to students who have received credit for BIO s10. Enrollment limited to 39. (Community-Engaged Learning.) [S] C. Essenberg. Evolution is the great unifying theory in biology. It is the context into which all other biological subjects fit. The course examines various aspects of evolution, including the origin of life, the major events in the evolution of life on Earth, the processes that result in evolutionary change, the nature of the fossil record, the history of evolutionary theories, and creationist objections to these theories. Enrollment limited to 39. [S] D. Dearborn. An introduction to the biology of plants and animals with an emphasis on the evolution of structure, function, and diversity within these groups. The inquiry-based, collaborative laboratory studies introduce students to fundamental principles of form and function in the organismal world, the quantitative analysis of data, scientific writing, and utilizing the primary literature. This course is intended to serve as the entry point for all life science majors including biology, biochemistry, neuroscience, and environmental studies (science concentration). Enrollment limited to 70. [S] [L] [Q] Normally offered every year. Staff. BIO 203. Bioinspiration and Biomimetics. Wind turbine blades inspired by insect wings are more efficient than conventional blades. The nose cones of Japanese bullet trains are modeled after kingfisher beaks to reduce noise pollution. Condiment bottles will soon feature a non-stick surface inspired by lotus leafs. Technology is increasingly looking to biology for design inspiration because evolution often yields elegant and robust solutions to real-world problems. In this project-based course, students will explore examples of biological form and function, and use this knowledge to design a product that is inspired by nature to solve a problem faced by today’s society. Prerequisite(s): BIO 190. New course beginning Winter 2019. Enrollment limited to 19. A. Mountcastle. This course explores how plants and animals interact with their physical world. Students draw on principles and tools of physics and mechanical engineering to characterize the functional implications of biological design and analyze how organisms generate and respond to flows, loads, and motions. Recommended background: prior experience with calculus. Enrollment limited to 19. [S] [L] [Q] A. Mountcastle. A survey of the varieties, morphology, development, evolution, and behavior of invertebrates with an emphasis on marine animals. Laboratory work includes the study, through dissection and experiment, of representative organisms. The course includes field trips to local marine habitats. Prerequisite(s): BIO 190. Enrollment limited to 14 per section. [S] [L] Staff. BIO 217. Human Anatomy and Physiology I. This course explores human anatomy and physiology with an integrative approach that links all organ systems to the neuroendocrine system and examines the interactions among organ systems. Topics include the organization of the human body; the nervous system and special senses; and the endocrine, musculoskeletal, and integumentary systems. This course is intended to fulfill the human anatomy and physiology prerequisite for students planning to apply to health professions programs such as nursing, physician assistant, physical therapy, and occupational therapy. Students planning to apply to veterinary programs should enroll in BIO 311 and BIO 337. Prerequisite(s): BIO 190 and CHEM 108A. Enrollment limited to 16. B. Salazar-Perea. BIO 218. Human Anatomy and Physiology II. A continuation of BIO 217, this course explores human anatomy and physiology with an integrative approach that links all organ systems to the neuroendocrine system and examines the interactions among organ systems. Topics include the cardiovascular, immune, respiratory, urinary, digestive, and reproductive systems. This course is intended to fulfill the human anatomy and physiology prerequisite for students planning to apply to health professions programs such as nursing, physician assistant, physical therapy, and occupational therapy. Students planning to apply to veterinary programs should enroll in BIO 311 and BIO 337. Prerequisite(s): BIO 217. Enrollment limited to 16. B. Salazar-Perea. BIO 221. Plant and Fungal Diversity/Lab. A survey of fungi, plant-like protists, algae, bryophytes, ferns and fern allies, gymnosperms, and angiosperms. Lecture, laboratory, and field studies emphasize diversity in morphology, physiology, evolution, ecology, and human uses. Prerequisite(s): one 100-level biology course. Open to first-year students. Enrollment limited to 21. [S] [L] [Q] B. Huggett. A view of life at the cellular and molecular levels. Topics include cellular energetics, membrane phenomena, genetics, and molecular biology. Laboratory studies include enzymology, bacterial transformation, the light reactions of photosynthesis, Mendelian genetics, bioinformatics, and DNA analysis using gel electrophoresis and polymerase chain reaction. Quantitative analysis of data and peer-reviewed scientific writing are emphasized. This course is required for the biology, biochemistry, and neuroscience majors. Prerequisite(s): BIO 190 and CHEM 108A Enrollment limited to 60. [S] [L] [Q] [W2] Normally offered every year. Staff. A course in the use of statistics in the biological sciences. The course focuses on core concepts and skills necessary for the analysis and interpretation of data, including types of data, the fundamentals of study design, sampling distributions, the meaning and interpretation of p-values and confidence intervals, statistical errors, and power. Students learn to select and carry out appropriate statistical tests for a variety of simple datasets. Statistical methods considered include analysis such as binomial tests, Fisher's exact tests, t- and chi-square tests, 1- and 2-way ANOVA, correlation and regression, and simple nonparametric techniques for numerical data. Prerequisite(s): BIO 190. Enrollment limited to 49. [S] [Q] Normally offered every year. C. Essenberg. Conservation biology incorporates biology, policy, and ethics, among other disciplines. This course introduces and analyzes conservation theory with emphasis on the biological aspects of conservation biology, but also exploring its interdisciplinary nature. Students examine conservation at many scales, including the conservation of populations, their genetic diversity, and the biodiversity of habitats. Applied aspects of conservation and sustainable development are explored through case studies and interactions with practitioners. Prerequisite(s): BIO 190 or ENVR 203. Enrollment limited to 39. (Community-Engaged Learning.) [S] [Q] C. Essenberg. BI/MA 255A. Mathematical Models in Biology. Mathematical models are increasingly important throughout the life sciences. This course provides an introduction to a variety of models in biology, with concrete examples chosen from biological and medical fields. Students work both theoretically and with computer software to analyze models, compute numerical results, and visualize outcomes. Prerequisite(s): MATH 205. Open to first-year students. Enrollment limited to 29. [Q] Staff. An introduction to ecological and evolutionary patterns, principles, and processes. Topics include life history and adaptation, speciation, mechanisms of evolution, population dynamics and interactions, community structure, and ecosystem processes. Laboratories include experimental investigations of several levels of biological organization using cooperative lab groups. Prerequisite(s): BIO 190. [S] [L] [Q] [W2] Normally offered every year. Staff. BI/ES 271. Dendrology and the Natural History of Trees/Lab. In this field-based course, students engage in the scientific study of the natural history and identification of trees and important shrubs native to New England, and some commonly planted non-native trees. Topics include the anatomy, function, taxonomy, biology, and uses of trees. Lecture topics support weekly outdoor laboratories, which include trips to such field sites as the Bates-Morse Mountain Conservation Area, Thorncrag Bird Sanctuary, and Wolfe's Neck State Park. Study of the woody flora of New England serves as a foundation for further work in biology, environmental studies, conservation, or related fields. Prerequisite(s): BIO 117, 124, 190, or ENVR 203. Enrollment limited to 24. [S] [L] B. Huggett. Ecological restoration assists the recovery of ecosystems damaged or destroyed by human activities, improving habitat for threatened species and increasing the ability of natural systems to serve a wide variety of human needs. Students learn ecological concepts and practical approaches used in this important and growing field and explore the complex human values that shape restoration goals and practices. Course activities emphasize critical reading of the primary scientific literature, discussion of restoration goals and practices, and developing skills relevant to restoration work. Prerequisite(s): one of the following: BI/ES 246, 271, 333; BIO 270, s32, s37; ENVR 240 or 310. New course beginning Fall 2019. Not open to students who have received credit for BI/ES 303. Enrollment limited to 15. (Community-Engaged Learning.) [S] C. Essenberg. Ecological restoration assists the recovery of ecosystems damaged or destroyed by human activities. Students learn ecological concepts and practical approaches used in this important and growing field and explore the complex human values that shape restoration goals and practices. Course activities emphasize exploration of case studies, critical reading of the primary scientific literature, and planning restoration projects. Prerequisite(s): one of the following: BI/ES 246, 271, 333; BIO 270, s32, s37; ENVR 240 or 310. Enrollment limited to 15. (Community-Engaged Learning.) [S] C. Essenberg. An introduction to the molecular and cellular principles of neurobiology and the organization of neurons into networks. Also investigated are developmental and synaptic plasticity, analysis of signaling pathways in cells of the nervous system, and the development of neurobiological research, from studies on invertebrate systems to usage of stem cell-derived brain organoids. Laboratories include electrical recordings from nerve cells, computer simulation and modeling, and the use of molecular techniques in neurobiology. Prerequisite(s): BIO 242. Enrollment limited to 12 per laboratory section. [S] [L] [Q] Normally offered every year. M. Kruse. BIO 311. Comparative Anatomy of the Chordates/Lab. An introduction to the comparative anatomy of the vertebrates and their kin, with laboratory study of both sharks and mammals. Prerequisite(s): BIO 190. Enrollment limited to 18. [S] [L] A. Mountcastle. An examination of the complex ecological interactions that structure marine systems. Habitats studied include intertidal, estuary, coral reef, deep sea, salt marsh, and pelagic. Laboratories include work in local marine communities and require occasional weekend trips. Prerequisite(s): BIO 270. Enrollment limited to 12 per laboratory section. [S] [L] [Q] Staff. A lecture and seminar examination of the molecular biology of viruses, including viroids and bacteriophages. Topics include viral infection and replication cycles, morphology, oncogenesis, and virus-host interactions. Viruses of epidemiologic and biotechnologic importance are emphasized. Prerequisite(s): BIO 242. Enrollment limited to 29. [S] Staff. A survey of the structure, function, and diversity of microorganisms, including viruses, bacteria, and eukaryotic microbes, with emphasis on adaptations to specific niches. Particular attention is given to organisms of ecological, medical, and industrial interest. Prerequisite(s): BIO 242. Enrollment limited to 25. [S] [L] [Q] Normally offered every year. Staff. This course explores the biochemical mechanisms of cellular functions with the goal of extending student knowledge about the structure, synthesis, and metabolism of biological macromolecules and contextualizing the regulation of these molecules in healthy and diseased cells and tissues. The course does not satisfy a requirement for the biochemistry major. Not open to students who have received credit for CHEM 321 or 322. Prerequisite(s): BIO 242. [S] Staff. BI/PL 323E. Philosophy of Evolution. Evolutionary theory raises many deep and complicated philosophical issues as well as questions about how science operates: Are concepts like function, selection, and optimality scientifically legitimate? How do we make inferences about the unobserved past? Can thinking about the evolutionary past help us understand how biological processes, such as the mind, work today? It also raises questions about who we are and where we come from: How do we relate to other species? Can we better understand our moral and intellectual strengths and weaknesses by looking to evolution? In this course, students approach questions like these from an interdisciplinary perspective, including philosophy, biology, and the cognitive sciences. Prerequisite(s): one of the following: PHIL 211; two courses in philosophy; or one course in philosophy and one course in biology. New course beginning Fall 2019. Enrollment limited to 15. [W2] M. Dacey. Developmental biology is a dynamic field that addresses questions related to how organisms come into being and grow. This course introduces students to developmental biology with a particular emphasis on the molecular basis for developmental events. The course focuses on the mechanisms involved in making cells that are different from one another (cell differentiation) and the associated mechanisms by which patterns are created (morphogenesis). In the lab, students explore the phenomenon of development in several of the most prominently utilized model organisms. The lab culminates in an independent project. Prerequisite(s): BIO 242. Enrollment limited to 19. [S] [L] Normally offered every year. L. Williams. A laboratory and lecture introduction to the molecular biology of genes and chromosomes. The course emphasizes current research about gene structure and function, experimental techniques, and eukaryotic genetics. Prerequisite(s): BIO 242. [S] [L] Normally offered every year. L. Williams. BIO 332. Ecology and Evolution of Mutualisms. This course explores how mutually beneficial interactions between species are maintained in the face of conflict and cheating and how these interactions influence the ecology and evolution of the species that engage in them. Students study the natural history of a variety of mutually beneficial interactions among species. A major goal of the course is to recognize how biological systems that are superficially different from one another can function in similar ways. Course activities emphasize critical reading of the primary scientific literature, using models to understand natural systems, framing scientific questions and hypotheses, and scientific study design. Prerequisite(s): BIO 270. Enrollment limited to 15. [S] C. Essenberg. BI/ES 333. The Genetics of Conservation Biology/Lab. Conserving biodiversity is important at multiple scales, including genetic variation within species. Does a species have enough variation to evolve in a changing world? Are individuals differentially adapted to local environmental variation? In a captive population of a rare animal, which individuals should be bred to minimize the erosion of genetic variation? Lectures and labs cover the fundamentals of classical, molecular, and population genetics, applying them to current issues in biological conservation. Prerequisite(s): BIO 242 or 270. Not open to students who have received credit for BIO 330. Enrollment limited to 15. [S] [L] D. Dearborn. The major physiological processes of animals, including digestion, circulation, respiration, excretion, locomotion, and both neural and hormonal regulation. Examples are drawn from several species and include a consideration of the cellular basis of organ-system function. Prerequisite(s): BIO 242. Enrollment limited to 16. [S] [L] [Q] R. Bavis. BIO 342. Ecological and Evolutionary Physiology. This course explores the interaction between the environment and physiological phenotypes in animals while emphasizing the role of evolutionary processes in shaping physiological variation. Topics may include the evolution of endothermy, adaptation to extreme environments (e.g., high altitudes, deserts), and controversial concepts such as symmorphosis. Readings from the primary scientific literature highlight diverse methodological approaches used to understand the evolution of physiological traits, such as comparative and phylogenetic analysis, selection experiments, genetic and phenotypic manipulation, and quantitative genetics. Prerequisite(s): BIO 270. [S] R. Bavis. The immune system is studied as an example of the body's chemical communication networks and as one mechanism for memory. Topics include production of an immune response, immune surveillance in the maintenance of health, the effects of psychological and environmental factors on the immune system and on health, and the effects of immune dysfunctions (autoimmune diseases and immune deficiencies including AIDS). The course emphasizes the human immune system but briefly covers comparative immunology. Prerequisite(s): BIO 242. Not open to students who have received credit for BIO 350. Enrollment limited to 29. [S] [L] Staff. BIO 355. Advanced Topics in Evolution. This course offers an advanced exploration of how evolution works. The first portion of the course is devoted to an overview of the major topics in evolution, ranging from micro-scale processes, such as mutation, to macro-scale processes, such as mass extinction events. The second portion of the course delves deeply into a small number of topics which vary from year to year but may include, for example, host-parasite arms races, sexual selection, and the evolution of aging. Prerequisite(s): BIO 270. Enrollment limited to 15. D. Dearborn. Offered at irregular intervals by a faculty member in an area of contemporary interest. A study of organismal and cellular functions important in the life of green plants. Topics include mineral nutrition, water relations, carbon assimilation, metabolism, and regulatory processes with an emphasis on how plant structure and function are influenced by pressures in the growing environment or by interactions with other organisms. Weekly laboratories provide a research-led approach to understanding physiological processes in plants. Prerequisite(s): BIO 190 and CHEM 108A in addition to one of the following courses: BIO 221, 242, 270, or BI/ES 271. Enrollment limited to 19. [S] [L] [Q] B. Huggett. Permission of the department and the thesis advisor are required. Students register for BIO 457 in the fall semester. Majors writing an honors thesis register for both BIO 457 and 458. Instructor permission is required. [W3] Normally offered every year. Staff. Permission of the department and the thesis advisor are required. Students register for BIO 458 in the winter semester. Majors writing an honors thesis register for both BIO 457 and 458. Instructor permission is required. [W3] Normally offered every year. Staff. Reading original biological literature is an essential skill for biology majors. Focusing on the topics addressed by invited speakers for the semester's biology seminar program, students review articles, write analyses, and contribute oral presentations in a small group format. Students attend afternoon and/or evening seminars and discuss the content, context, and presentation of original investigations. Prerequisite(s): BIO 190, 242, and 270. One of these courses may be taken concurrently, only by permission of the instructor. Not open to students who have received credit for NRSC 460. Enrollment limited to 19. [W3] Normally offered every year. Staff. Laboratory, field, or library study of a current research topic in experimental ecology. A topic is selected with reference to the research interests of the instructor. Prerequisite(s): Biology 270. Enrollment limited to 6. Instructor permission is required. [S] [L] [W3] C. Essenberg. Laboratory or library study of a current research topic in animal physiology. A topic is selected with reference to the research interests of the instructor. Recommended background: BIO 337. Enrollment limited to 6. Instructor permission is required. [S] [L] [Q] [W3] Staff. Laboratory and library study of a current research topic in the experimental study of biology at the cellular level. A topic is selected with reference to the research interests of the instructor. Recommended background: BIO 242. Enrollment limited to 6. Instructor permission is required. [W3] Staff. Laboratory or library study of a current research topic in evolutionary biology. A topic is selected in reference to the research interests of the instructor. Prerequisite(s): BIO 242 and 270. Enrollment limited to 6. Instructor permission is required. [S] [L] [Q] [W3] D. Dearborn. Laboratory and library study of a current research topic in microbiology or immunology. Topics are selected with reference to the research interests of the instructor and students. Prerequisite(s): BIO 242. Enrollment limited to 6. Instructor permission is required. [S] [L] [Q] [W3] Staff. BIO s10. Biology of Cooperation. This course explores why organisms cooperate and how cooperation can be maintained in the face of cheating. Topics include the evolution of sociality and cooperation within species as well as mutually beneficial interactions among species. Students consider how the same broad ideas about conflict and cooperation can apply to organisms ranging from bacteria to humans and explain phenomena as disparate as pollination and cancer. Students evaluate evidence for various models of cooperation, learn how to use data to understand why organisms cooperate, and develop their own cooperation and communication skills through group activities and a community-engaged learning project. Not open to students who have received credit for BIO 133. Open to first-year students. Enrollment limited to 29. (Community-Engaged Learning.) [S] C. Essenberg. BIO s13. Health and Medicine: At Home and Abroad. In this course, students examine and compare the major causes of morbidity and mortality in the United States and Spain, a developed country with a healthcare delivery system different from that in the United States. Through readings, discussion, shadowing, and on-site visits with healthcare professionals during a two-week visit to Spain, students arrive at a deeper understanding of the biology underlying the diseases they investigate and how those diseases are treated in each healthcare system. Such a study allows students to compare the influence and importance of culture and community on the interplay of health and disease. Prerequisite(s): One course that informs the study of health and medicine, which includes 100-level biology courses and courses in anthropology, gender and sexuality studies, psychology, or sociology with topics related to health and medicine. Recommended background: Previous study of Spanish is recommended. Open to first-year students. Enrollment limited to 12. Instructor permission is required. [S] K. Palin. What is gut biology? The gut is an ecosystem full of complex interactions between human and microbial cells. Like all ecosystems, the environmental features of the gut affect its stability and diversity, which can influence our overall health. This laboratory-based course looks at the anatomy, physiology, and ecology of the gut to reveal how it supports the intricate communication network between microbial and human cells. Basic biology laboratory techniques including light microscopy, histology, DNA/RNA characterization, and bioinformatic data analysis are used to study the nature of this symbiosis. Enrollment limited to 20. [S] [L] [W2] Normally offered every year. L. Brogan. As a cause of mortality in the Western world, cancer is second only to cardiovascular disease. What causes cancer? How is cancer diagnosed and classified? How do flaws in fundamental biological processes drive cancerous growth? What are current therapeutic options and potential new treatments in the fight against cancer? These questions are explored in the classroom and the laboratory. Not open to students who have received credit for BIO 108. Enrollment limited to 40. [S] [L] Staff. This course introduces students to how scientific knowledge is produced. In the unique setting of the Mount Desert Island Biological Laboratory, an internationally known research facility, students design and carry out lab and field research projects. Students learn the fundamentals of data collection, interpretation, and presentation. Through discussions and attendance at formal scientific seminars, students also consider the nature and social value of the scientific process. Course reinstated beginning Short Term 2019. Not open to students who have received credit for BIO s20. Enrollment limited to 12. [S] [L] L. Brogan. BIO s25. Microbes and Everyday Life/Lab. Microorganisms, most so small that we cannot see them without microscopes, run the world in which we live. They recycle elements and nutrients, play a role in wastewater treatment, cause disease and keep us healthy, produce some of our food and many of our pharmaceutical products, and much more. Through readings, discussions, field trips, and laboratory investigations, students explore the remarkable diversity in habitats and metabolic activities exhibited by the microbial world we encounter every day. Not open to students who have received credit for BIO 315. Enrollment limited to 19. [S] [L] Staff. BIO s30. Ecology and Natural History of the Maine Coast. This course examines the ecology and natural history of the coast of Maine using a combination of experiential learning (field trips, lab activities, group research project) and interactive lectures and presentations by guest speakers. Students have the opportunity to experience the ecology and natural history of the Maine coast, including saltmarsh, sandy beach, mudflat, and rocky shore ecosystems. This course includes at least one community-engaged learning activity. Students gain skills in the identification of local marine flora and fauna, experimental design and hypothesis testing, and science communication to varied audiences. Prerequisite(s): one biology course. New course beginning Short Term 2019. Enrollment limited to 12. One-time offering. K. Dobkowski. Birds are among the most conspicuous animals in the environment, occupying terrestrial and aquatic niches from the tropics to the poles. This course examines the origin and diversification of birds and explores avian morphology, physiology, and behavior in an ecological and evolutionary context. Topics include flight, communication, feeding, migration, and reproduction. The course includes a laboratory and requires several extended field trips. Prerequisite(s): BIO 270. Not open to students who have received credit for BIO 335. Enrollment limited to 12. D. Dearborn. BIO s32. The Ecology and Evolutionary Biology of the Galápagos Archipelago. This course studies the principles of ecology and evolutionary biology in the birthplace of the theory of evolution by natural selection. The Galápagos archipelago is one of the world's most important areas for biology given its isolation, rough terrain, and distinct oceanographic features. Students visit several islands during a three-week trip to explore terrestrial and marine ecosystems using field techniques. Island habitats are contrasted to learn how organisms have been shaped by the abiotic environment and by the spatial arrangement of the islands. Home stays and community-engaged learning are an integral part of the course. Prerequisite(s): BIO 158 or 270. Enrollment limited to 14. Instructor permission is required. (Community-Engaged Learning.) [S] [L] [Q] L. Williams. BIO s37. The North Woods. An investigation of the patterns and history of New England's forests and associated plant communities, with an emphasis on field study and research. Students review the influences of geological patterns, climate, unusual soil and water conditions, natural disturbances, invasive plants and insects, and human activities on community type, occurrence, and history. Central to the course are visits to a variety of field sites, where students learn to describe the structure, composition, and history of several communities. Primary literature is emphasized. Prerequisite(s): BIO 270 or ENVR 310. Enrollment limited to 8. (Community-Engaged Learning.) [S] [L] B. Huggett. Plants form the base of terrestrial ecosystems and, because they are easy to observe, play a prominent role in ecological research. This course explores interactions between terrestrial plants and their environments, focusing on the population and community levels of ecology. It emphasizes independent field research and includes substantial time spent outdoors, as well as some overnight field trips. A major goal of the course is to enable students to apply ecological knowledge to decision making, particularly in the context of conservation efforts. Prerequisite(s): BIO 270. Enrollment limited to 15. C. Essenberg. BIO s40. Experimental Developmental and Molecular Biology/Lab. In this hands-on, laboratory-based course, students learn and practice the scientific method. Living and working at the Mount Desert Island Biological Laboratory, known for its educational and research programs focusing on non-mammalian systems, students work with the important vertebrate model system, zebrafish, and utilize cutting-edge molecular and microscopy techniques to address questions related to protein pathways involved in the developmental process. Independent projects and oral presentations are a central requirement of the course. Prerequisite(s): BIO 242. Enrollment limited to 12. [S] [L] L. Williams. A study of contemporary research techniques in the fields of neurobiology, physiology, and pharmacology. Topics may include the pharmacology of recombinant neurotransmitter receptors or the physiology and pharmacology of invertebrate neurons. This course requires extensive laboratory work in independent projects. Prerequisite(s): BIO 242. Enrollment limited to 12. Instructor permission is required. [S] [L] Staff. BIO s47. Experimental Cell Biology/Lab. In this laboratory-based course, students investigate how lipids and proteins act together to regulate cellular activity. Using state of the art research facilities on campus and at Mount Desert Island Biological Laboratory near Bar Harbor, ME, students work with an immortalized cell line to address questions of neuronal signaling pathways by applying molecular, biochemical, and microscopy techniques. The course introduces students to the mathematical programming language R, and trains students in using R to analyze experimental data. Prerequisite(s): BIO 242. New course beginning Short Term 2019. [S] [L] [Q] One-time offering. M. Kruse.